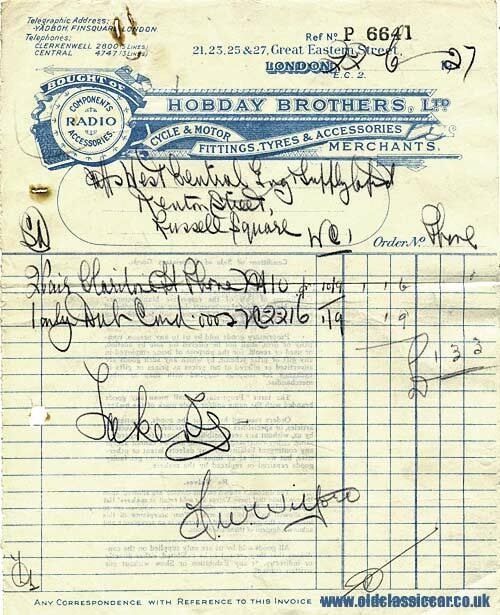 An invoice from Hobday Brothers in 1927. Homepage. This page: A good example of a vintage illustrated billhead, relating to the motor industry in the twenties. Hobday Brothers Ltd occupied premises at 21, 23, 25 & 27 Great Eastern Street, Shoreditch in London, and were suppliers of "cycle & motor fittings, tyres & accessories", in addition to radio componentry. This invoice, for a phone order, was issued on 22nd June 1927 to the West Central Engineering & Supply Co. Ltd.
Research shows that part of the Hobday Bros premises are now used by a cinema equipment supplier (No.21), although I've not found any references to the other building numbers. Present-day photos of Great Eastern Street show that significant re-development of the buildings has taken place over the years, so it's quite likely that the building used by Hobdays no longer survives. In fact many of the buildings seem to be covered in graffiti now, with two old underground carriages, perched on top of an old viaduct, equally disfigured.